In 2017, the average number of clients served per month was 979, or 225 clients per week. With the help of many volunteers and donations, over 383,000 pounds of food were distributed in 2017 by the Morrison County Food Shelf. There are more than 300 food shelves in Minnesota, serving every county in the state. 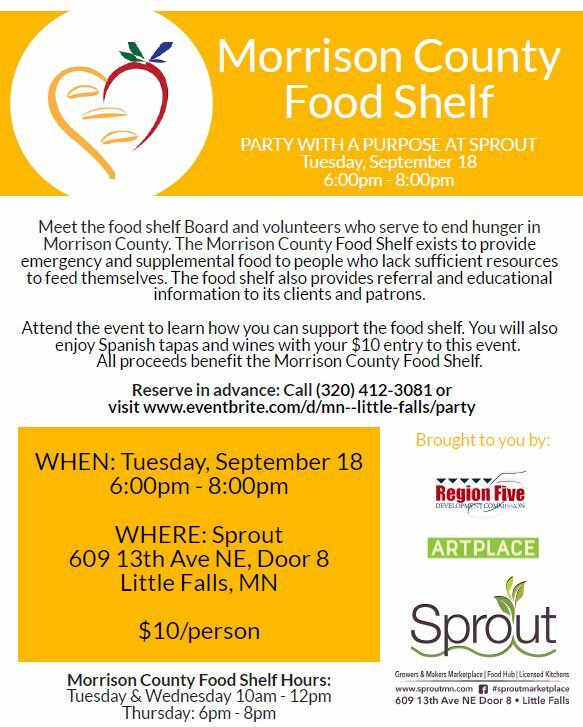 LITTLE FALLS, Minn. – August 27, 2018 – Morrison County Food Shelf will host a “Party with a Purpose” event on Tuesday, September 18 at Sprout (609 13th Ave NE, Door 8, Little Falls, MN 55345). The party will raise funds for the the food shelf’s mission to end hunger in Morrison County. The Morrison County Food Shelf exists to provide emergency and supplemental food to people who lack sufficient resources to feed themselves. The public is invited to attend the event to meet the food shelf Board and volunteers and learn about their work, including testimonials from those who have been assisted by the food shelf. “The food shelf is just one piece of the food access puzzle, and right now there’s a lot of opportunity for collaboration, whether it’s Fare for All, Ruby’s Pantry, Share A Meal, or Sprout,” says Kate Bjorge. “We hope community members will attend this event and be inspired by the stories of their neighbors to continue to support these initiatives.” The Morrison County Food Shelf is located at 912 1st Avenue SW, Little Falls, Minnesota and it’s open hours are Tuesdays and Wednesdays from 10am - 12pm and Thursdays from 6pm - 8pm. The food shelf is currently recruiting volunteers to serve, especially those with skills and expertise in electric, plumbing, and building repairs. The food shelf is also hiring for a paid position to clean up to four hours per week. To learn more about these opportunities contact Director Carol Schirmers-Johnson at 320-632-8304. The Parties with a Purpose activities are funded through a grant awarded to Region Five Development Commission by ArtPlace America’s National Creative Placemaking Fund. The ArtPlace funds are providing the Sprout Growers & Makers Marketplace and partners the support needed to host an expansion of economic opportunities, social and cultural experiences, and learning for local growers, artists, makers, producers, chefs, and the public. Sprout and partners will also build out the Marketplace's physical space over the next three years using commissioned functional art from local artists, with priority granted to Latino, East African, Native American, Amish, grower, and youth communities. Sprout strives to connect and strengthen the local food system as a regional asset, operating from their facility centrally located in Little Falls, Minnesota. The Sprout facility hosts the monthly indoor Growers & Makers Marketplace as well as a shared-use commercial kitchen to promote food entrepreneurship and community gatherings around food, art, and culture. Sprout is a federally recognized 501c3 non-profit organization. The community is invited to shop the Sprout Growers & Makers Marketplace vendors selling local food and art on Saturdays from 10 a.m. to 3 p.m. on October 27, November 17, and December 8. Interested growers, artists, chefs, community members, and educators who want to learn more, visit www.SproutMN.com and follow the Sprout Growers & Makers Marketplace on Facebook.